Businesses that are looking to get their staff out of the office are discovering a playful paradise in Temecula Southern California Wine Country. Businesses that are looking to get their staff out of the office are discovering a playful paradise in Temecula Southern California Wine Country. 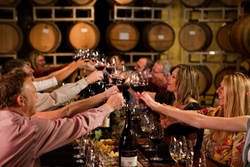 With breathtaking panoramic views, horseback riding trails through the vineyards, hot air balloon rides above wine country, aromatic barrel rooms and wine cellars, and rolling hills with pristine golf courses, Temecula Valley is a beautiful getaway spot that offers memorable team building opportunities. Weekdays are ideal for team building trips in Temecula Valley, conveniently located 60 minutes from San Diego, Orange County, and Palm Springs; 90 minutes from Los Angeles. Ponte Winery, South Coast Winery, Mount Palomar Winery, Wilson Creek Winery, Callaway Vineyard & Winery, and Lorimar Vineyards & Winery all offer seasonal public grape stomping experiences during harvest season (August & September). Wilson Creek Winery also offers team building grape stomping competitions with a bottle of wine to the first team that fills a bucket with grape juice. Several wineries offer a wine blending class. The group breaks up into teams, samples various wines then blends their favorites to create their own special creation. Once complete, they create their own custom label. Race through the vineyards in search of that perfect angle with Wilson Creek Winery’s photo scavenger hunt. The groups will come up with creative names for their teams and hunt around the winery and vineyards with the help of clues in two time-limited lists. Grape Escape offers team building hot air balloon rides. Groups will get several private charters (depending on group size) and launch into the air for multiple competitions. Drop bean bags onto a ground target from the flying basket of a hot air balloon or test logistical balloon knowledge while in flight. Monday through Thursday are recommended days for airborne competitions. Temecula Valley’s championship golf courses offer private golf tournaments for friendly competitions or putting challenges on the green. Courses include Temecula Creek Inn, Journey at Pechanga, The Legends Golf Club, Red Hawk Golf Course, and CrossCreek Golf Club. Book a tour and venture through Temecula Valley’s member microbreweries. Black Marketing Brewing Co, Garage Brewing Co, Wiens, and Karl Strauss all offer tasty exploring experiences. This annual April event offers a fun scavenger hunt experience throughout Temecula Valley. Work as a team in an Amazing Race style hunt to achieve victory. Pechanga Resort & Casino holds private poker and bingo competitions. Southern California’s finest poker room offers all the favorite games. Groups can enjoy friendly competition in a very unexpected bingo room with comfortable chairs, a giant screen, fun music and unlimited soda and popcorn. Pechanga Resort & Casino, wine country, and Old Town restaurants offer private dining experiences with special custom culinary courses. Several also offer cooking classes, as well as food and wine pairings. Work as teams or compete against one another to find a way out of the challenging annual corn maze. This year’s maze is open from October 1st through the 30th and offers a team building activity or just an escape from the busy office. Use clues for certain turns or time limits to make the maze more challenging. Each year is a different design so this activity never gets old. *Information is believed accurate but may be subject to change. All group events and activities require advanced reservations and arrangements. With natural gifts of climate and geography Temecula Valley is recognized for scenic vineyards, award-winning wines, and gracious, friendly wineries as Temecula Valley Southern California Wine Country. The popular boutique friendly destination includes the Temecula Valley A.V.A. (American Viticulture Area) as well as Downtown Old Town Temecula, Pechanga Resort & Casino, and the Temecula Wine Country Golf Trail. Visit Temecula Valley is the region’s official tourism marketing organization and an online resource for visitors at VisitTemeculaValley.com. Temecula Valley Visitors Center is located in Old Town Temecula (Third Street and Mercedes). For visitor information and assistance, call 888/363-2852 or 951/491-6085.